Fanny Kaplan (born as Fanny Yefimovna Kaplan in Volhynian Governorate, Russian Empire (now Ukraine), died in Moscow, Russian SFSR) was a famous Activist from Russia, who lived between February 10, 1890 and September 3, 1918. She became only 28 years old. 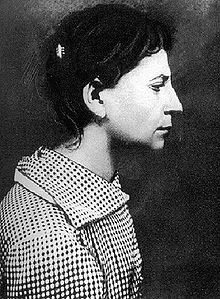 Fanya Kaplan Yefimovna (also known as Fanny Kaplan and as Dora Kaplan) was a Russian political revolutionary who was behind a failed assassination attempt on Vladimir Lenin. My name is Fanya Kaplan. Today I shot at Lenin. I did it on my own. I will not say from whom I obtained my revolver. I will give no details. I had resolved to kill Lenin long ago. I consider him a traitor to the Revolution. I was exiled to Akatui for participating in an assassination attempt against a Tsarist official in Kyiv. I spent 11 years at hard labour. After the Revolution, I was freed. I favoured the Constituent Assembly and am still for it. When it became clear that Kaplan would not implicate any accomplices, she was executed on September 3, 1918. She is born under the zodiac aquarius, who is known for Knowledge, Humanitarian, Serious, Insightful, Duplicitous. Our collection contains 1 quotes who is written / told by Fanny. "After the Revolution I was freed. I favoured the Constituent Assembly and am still for it"